All the things. Pretty much highlighting the stuff I wrote about in the last post are ready for prime time. The best thing is that I finally got a settings screen in there. And, hey, a Quit Button (guh, can’t believe I dragged my feet on that). New Auto Fire Update – version 0.5.5! Added an automap so you can see where the hell you’re going. You can bring it up with the [Q] key. Added a faction system. Each sector has a generated gang that rules it, and a boss that controls each combat zone. Defeating the boss clears the zone. Boss arc now includes escalations that spur the bosses to taunt their forces and you with procedurally-generated shouts. The quest system had some work done on it. Now the player is automatically assigned a quest to take out bosses of places they conquer. Quest completion now has a dialog box and some information on the results. The encounter dialog has a new layout, and it shouldn’t justify its text strangely anymore. The Shotgun soldiers are much less deadly than they were. Unity 2018.3 update, which should improve terrain performance a bit. Some of the road decals had dreadful performance, so exterior spaces run a bit better now as a result. Toying around with a little bit more of an intro on the title screen. I’m trying an outline shader on all gameplay objects to help them pop from the background. Pulled up and adjusted the lighting to mellow some of the hard shadows that was creating visual noise. Terrain is a fair amount brighter now. The garage looks a bit less out of place now. Still work to consolidate the colors. Difficulty now represented with bullets. Time slows when you die. Armor sides weren’t appearing on the vehicle with the proper direction. Multiple Line of Sight fixes. You should not be able to be hit through obstructions now. Fog uncovering on the map, the fire arc grid, and actual combat should all reliable return the same LOS results. 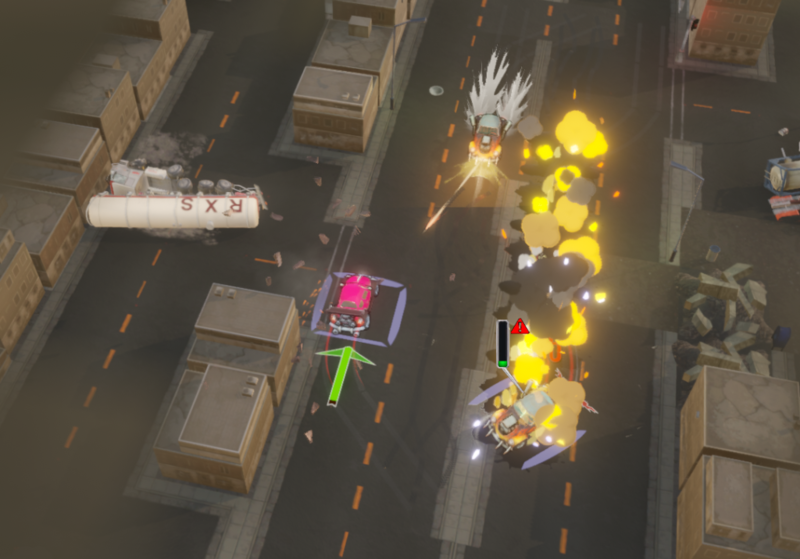 The player was able to exploit a bug that allowed them to use any side weapon against enemies in any direction. Fixed. Removed some visual stray VFX sprites on the scouts. The (correct) car model appears again on the inventory and garage menus. Exploding barrels had stopped harming things. Fixed now. Vehicle models now have manufacturer logo in info. I had a bit of a weird week because I was coming off the RoguelikeCel, but after the feedback I got I knew just what to focus on for this new update. Enemy cars can shoot again! Yeah sooooo I recently added some infrastructure so that player vehicles can have unique loadouts that are independent of the model of car itself. 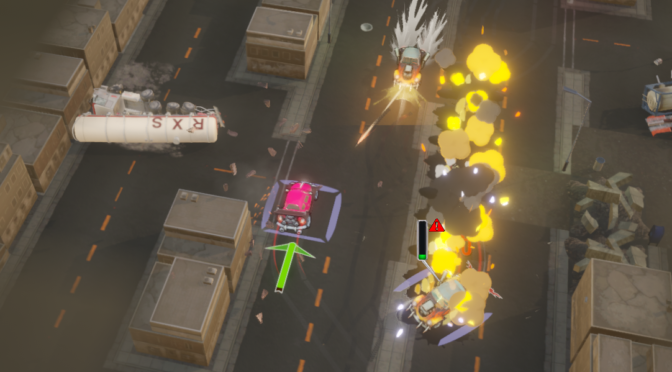 …annnnd while I got it all working for player vehicles, I broke the ability of enemy cars to have their own weapon loadouts too. So they didn’t actually have any weapons mounted. 😛 Fixed! The existing health post attached to vehicles in the world was straight up and down, and hence blocking the view of important info such as the state of the front weapon, or your speed when reversing. The style of the health bar is now adjusted to be a bit less disruptive. Smoothed out the speed indicator angle so it rotates more gracefully. Improved the speed chevrons (both the green and red) to be more visible. Added grip indicator for the player on top of the speed indicator, for the player car only. Speed arrows and grip indicator grow in a more visually pleasing way. So the previous model of vehicle skidding either gave you complete control or zero control. It never felt good since people’s instinct is to push against a skid in various ways to try to influence it. The speed indicator now has a display of “hazard levels” beyond the speed itself. A broken chevron means that you are skidding more out of control. The “hazard skid” levels supplement the standard “grip down to zero with a red speed indicator” style of skidding. If you have a hazard skid, you can turn but can’t influence your movement. If you are skidding but do not have any hazard skid levels, you can influence your movement by 45 degrees by accelerating to the side. Thus a skidding vehicle can still trace wider arcs. You can accelerate or decelerate your skid by pushing towards or away from the direction of skid. Skidding and grip now recharges more reliably based on whether you are facing in the direction of the skid. So that’s it for now. I’m adding a little more info on the Itch page about the systems that Auto Fire (in its current state) will support for now. Someone asked for a 32-bit version, although I’m not sure I’d recommend older machines until I slim down some of my meshes. In the future I’ll put more work into optimization and alternate OS’es like Linux. Auto Fire v0.5 build posted! What’s that? 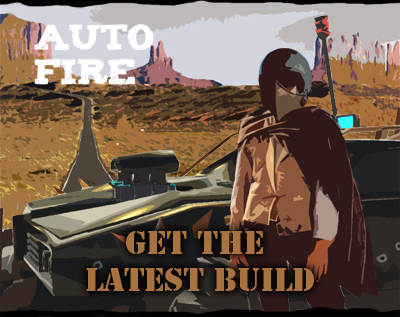 A work-in-progress build of Auto Fire is up on Itch.io? Check out version 0.5 here!! Don’t worry, you don’t have to donate to try it out. It’s still got a lonnnnng way to go. Camera now behind the vehicle in both overworld and combat. Dynamic camera and VFX based on speed. Map state is saved when when returned to. Revised environment visuals for clarity. More garages everywhere to install your loot. UI improvements for better feedback on weapon state and skidding. Improved progression arc. No real balance as of yet. More weapons, equipment and enemies. Special maneuvers like bootleggers and charge rams. Encounters on the overworld map. Boss fights that clear out a hostile area when defeated. Citadels as a destination for weapon and vehicle stores, cargo missions, arena duels, and a bar for rumors. Fame and skill progression tracking, with media coverage of select combats. Target painting, sustained fire, and other ways to increase or decrease the chances of. As always, feedback is so, so, so very welcome. Let me know what you think!